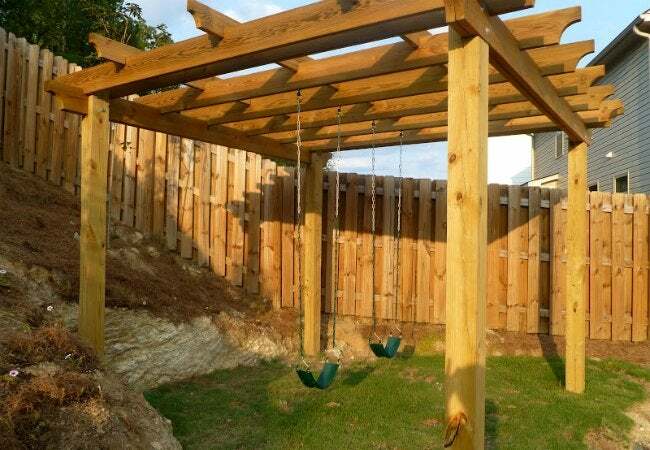 Instead of spending thousands on a fancy backyard play area, spend this weekend building your own swing set! Your kids will definitely thank you later, if you can get them to take a break from swinging. 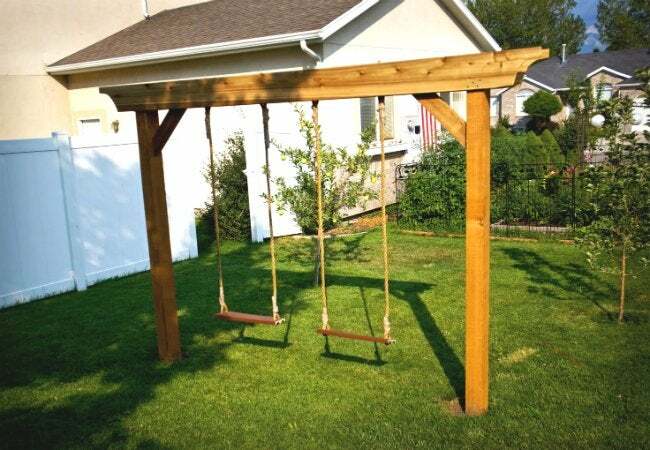 The earliest swing sets, which date all the way back to the fifth century B.C., were nothing more than slabs of wood tied to a tree—the most basic of designs. Today, however, the outdoor staple has evolved to include not only the simple swing but also multi-seat options and elaborate structures complete with slides, rock-climbing walls, and even miniature patios. Although the market overflows with models, you can choose to build your own. Taking on the project yourself saves money and ensures that the result will meet all your family’s wants and needs. 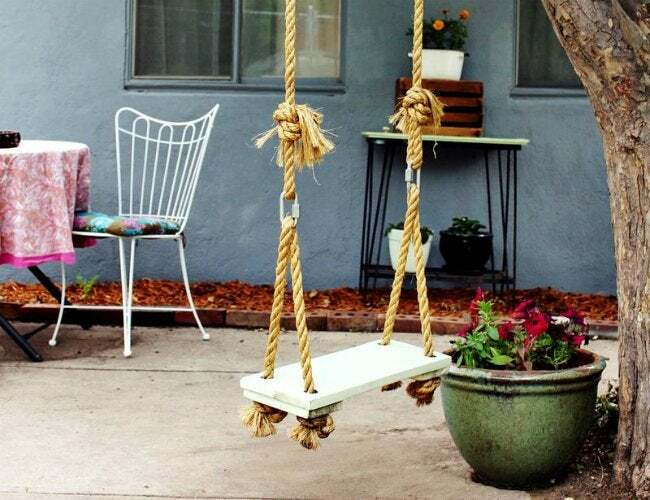 Whether you’re interested in just a few swings or a full backyard playground for the kiddos, get inspired to get active this weekend with one of our five favorite DIY designs. You have a tree? And access to scrap wood and long rope? That’s all you need for this insanely easy DIY from A Beautiful Mess. It uses the same design concept as the very earliest swings—just a seat strung up from a tree limb. If you don’t have a yard or a sturdy tree, you can just as easily use the same tutorial to make a swing to enjoy indoors. Take your standard A-frame to new heights with a custom-made airplane seat and a fresh coat of red paint. While this setup may initially seem a bit intimidating to craft, it’s much easier than it looks! And it keeps to an under-$50 budget. The key to successfully tackling this project is visualizing how all the pieces fit together prior to construction—and these plans at Ana White can help you out. 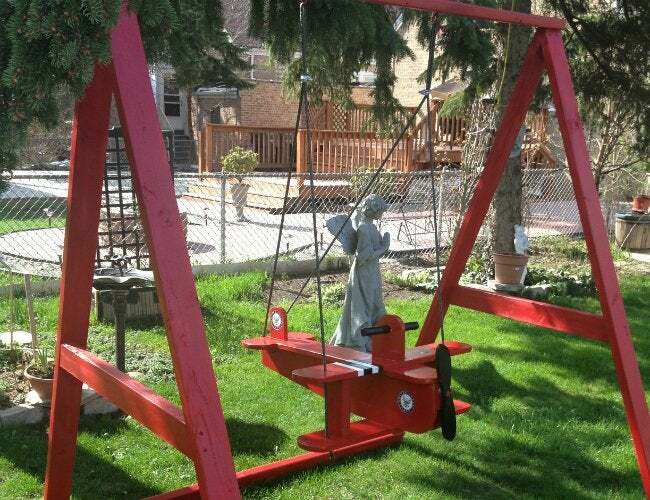 Now here’s a beauty of a simple swing set. While the basic structure of this classic design uses three pieces of lumber (two for the sides and one across the top), Mandi of Tidbits from the Tremaynes upgraded her set with a few extra pieces in order to mimic a pergola. Her other brilliant idea: making the swing seats from Trex, an extremely durable composite deck material that’s completely splinter-proof! If you’re looking for the perfect outdoor kiddie kingdom, look no further than this play palace and built-in swing set. The family behind Our Fifth House constructed their dream backyard structure from scratch, complete with finishing touches like outdoor seating, cushions, and an ottoman for unwinding after an exhausting afternoon of play. 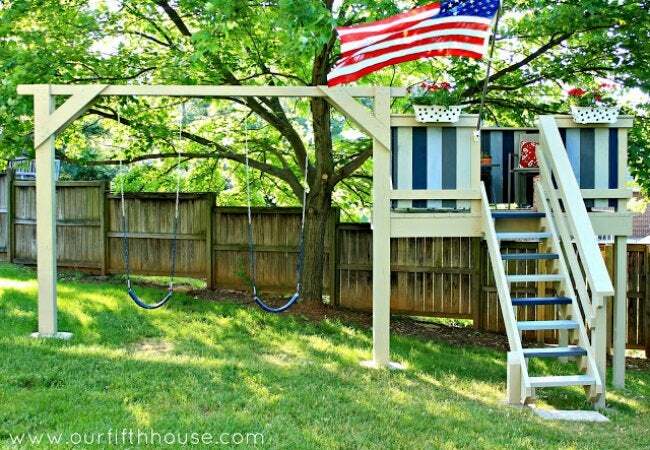 But this idea can work on an existing playhouse, too, if you rely on a post that holds up the fort to also support your swing set’s bar. A fixed outdoor swing set is not for everybody, especially if you plan to move later on down the line. Only From Scratch blogger Lauren constructed a pergola to allow the freedom to change up the outdoor living area on a whim. If you use a pergola as the basic structure, you can switch between individual swings and a porch swing—or even lose the swings altogether, replacing them with a table for some great alfresco dining.